Big Grizzly Mountain Runaway Mine Cars is Hong Kong Disneyland's version of Big Thunder Mountain Railroad, right down to the lengthy and parallel-sounding name. It's a next generation version, with forward and backward sections, a launch and a couple of lift hills, and plenty of thrills. The roller coaster intertwines Grizzly Gulch, and though it may seem a little more grown-up than the average Disney roller coaster, it's definitely a lot of fun that both the young and old will enjoy (as long as they meet the height limit)! 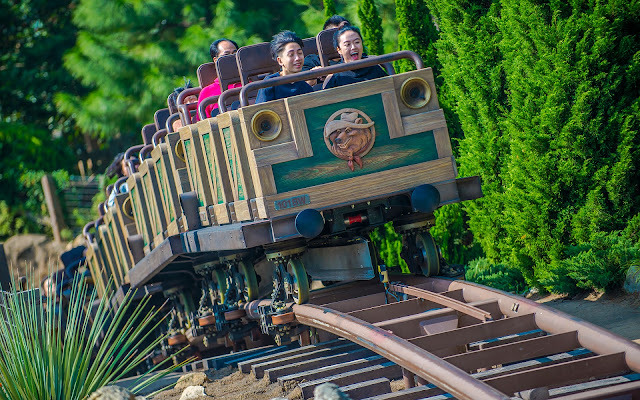 A train on Big Grizzly Mountain Runaway Mine Cars hurtles over a hill.